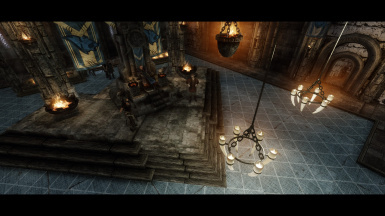 A large, complete overhaul of 6 major palaces and castles in Skyrim. Thank you Lind, for your most beautiful blurrobe textures. Thank you Vaultman, for allowing me to implement your Hauberk armors. Thank you Brumbek, for allowing me to use Ring meshes and Apple mesh from Static Mesh Improvement Mod. Thank you DDVIL, for your amazing ring textures in Rings fit for a King-Queen. Thank you Tarshana, for your Winterbrook Furnishings. 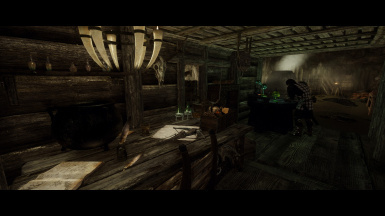 Thank you SpinaDeMul, for Whiterun Interior Expansion Kit. Thank you Guardian300, Foxia, Exeter, Dimon99 for your Stormcloak Battle Armor. Thank you Saerileth, for your Gemling Queen Resources. Thank you LorSakyamuni, for The Witcher 3 Monsters and Animals Resource Pack and The Witcher 3 Mega resource Pack. Thank you, Necrocytosis for your colored Xmarkers. Even though I spent a lot of time making sure not to include any assets that I weren't allowed to use and to write every person's name and his/her work for their contribution, it is possible that I forget to include their name in this list. If you should find any problems with how I write this credit section, please contact SetteLisette. Compacted FormIDs for the following ESL patches: Cutting Room Floor, ELFX, Holidays, Immersive Citizens, Interesting NPCs, Realistic Lighting Overhaul, and Skyrim Sewers. Also added another archive containing non-ESL flagged ESP variants of the compatibility patches. Slightly revamped Castle Dour. Other minor changes, optimizations, and fixes to the main file and the patch files. 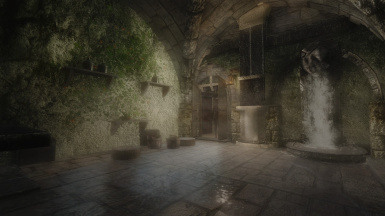 [*] Revamped the entrance hall of Castle Dour. 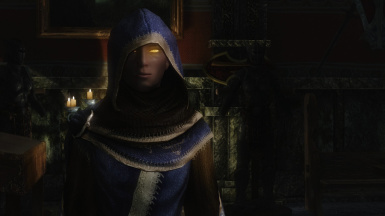 [*] "Imperial Mage" the NPC in Castle Dour has been altered to use vanilla Imperial soldier as template. 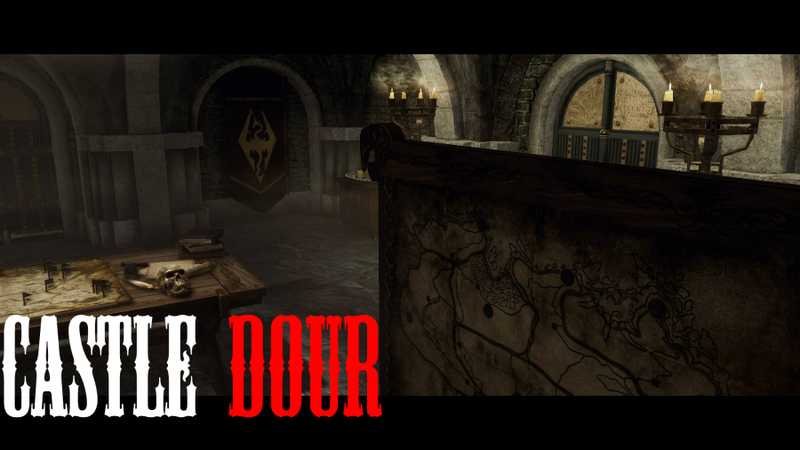 [*] Changed the lighting template used in Castle Dour. [*] Fixed minor visual errors or glitches in Dragonsreach and Castle Dour. [*] More fixes from Unofficial Patch were integrated. 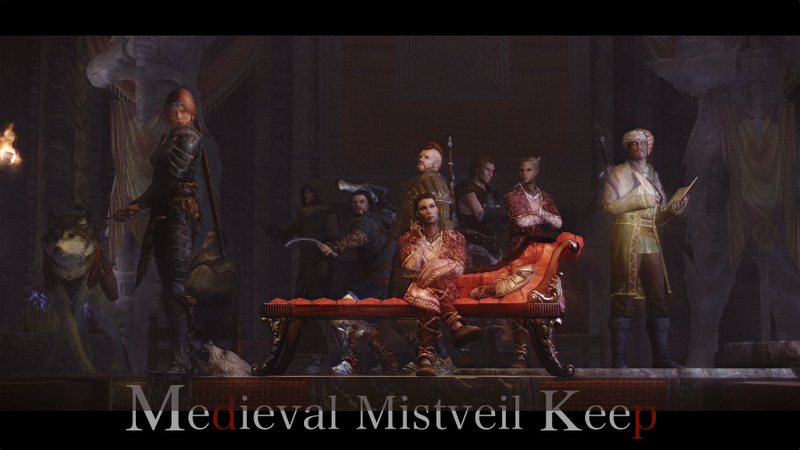 [*] Fixed an issue where some NPCs trying to start a conversation scene in Mistveil Keep might permanently get stuck. [*] Cleaned up a few ITMs, 1 Navmesh warning, and 1 FaceTint error detected with the latest xEdit. [-] Removed 2 music scores from the music track. [*] The Add-On "Marked and Droppable Barenziah Stones" is now included with the main plugin. [*] Cleaned masters, ITMs, and a few minor warnings in many of the patches. [*] Improved the patches for lighting mods (ELFX, RLO, Relighting Skyrim, Shadows) so they work as intended if for some reason Palaces Castles Enhanced.esp isn't loaded after these lighting mods as instructed. [*] Immersive Citizens patch has been updated to work with its latest version, 0.4a. [*] Improved the patches for Interesting NPCs, Skyrim Sewers, and Open Cities. [*] All of the patches and add-ons for SSE edition are now flagged as ESL. Some users noted an issue with starting the quest "Boethia's Calling". USLEEP fixed this problem but I implemented my own approach to fix this issue by keeping the quest itself untouched. Location data used in several interior cells have been fixed, allowing the Thieves Guild radiant quests to be available in a couple of interiors. Blue Palace Parlour has been modified with improved lighting and decorations. Update for the Compatibility Patches will be available in 2~3 days. Removed several decorative items in Farenger's room. Contains a fix for the CTD problem with Oldrim version. Slightly moved and adjusted furniture and other clutter items for better and wider passages. After the Dawnguard's main quest, you will be able to obtain Bone Hawk Ring and Amulet near the Enchanting Table in the workshop area. The stairs in the hallway are applied new textures. Fixed an issue where Sybille Stentor's bed not being replaced with the new, red-colored one. The mini-quest that takes places when you go down to the Cellar has been revised yet another time to correct some issues. Made minor fixes to the behaviors of several new NPCs in Palace of the Kings during the Battle for Windhelm quest. Unconfirmed fix for CTD upon entering the interior cell. Let me know if you still have CTDs or this update fixed this issue. Type in setstage PCEChangeOutfit 100 in your console. Relationship Dialogue Overhaul Patch has been added RDO as a master file. Holds the City Overhaul Patch has been removed from the archive. I'm facing a critical, technical issue with it. I know it's a long shot but if anyone can help me with this please let me know. Note that I'm experienced in creating compatibility patches for Oldrim. For a complete list of new additions and changes, please see the description. (1) All actors in the conversation should face each other and use proper facial expressions when appropriate. (2) All conversations should be smooth and free of strange, awkward silences, and some scenes should be more dramatic. In the past versions, I have revised some conversations scenes in Mistveil Keep sort of like an experiment. I noticed that many of the interaction scenes we see in the palaces and castles could use some modification. Now, with my edits, all actors will face each other throughout their conversations. They will no longer stare at you awkwardly as they talk to another person. They will now use facial and gesture animations when appropriate. In some scenes, actors will move to a certain location in the palaces and castles in order to start their conversations. There are also several conversations which I modified so that they won't be triggered unless certain conditions are met. Remodeled the Stewards Living Quarters a bit. I did not like the former design. I have also changed the lighting to enhance the atmosphere. Fixed a problem in which the Jagged Crown will not be correctly shown up in the Jarl's Living Quarters. Fixed a few issues with object alignment. Torsten Cruel-Sea and Captain Lonely-Gale are given new daily schedules. Twice a week, they will vist Palace of the Kings. In vanilla, these 2 NPCs were supposed to have a conversation with Ulfric, which I cannot recall seeing before. Lighting settings in Freyja's Potions are revised (Taken some people's criticisms). Rewritten the script regarding the Jagged Crown appearing after retrieving it for the Stormcloaks. 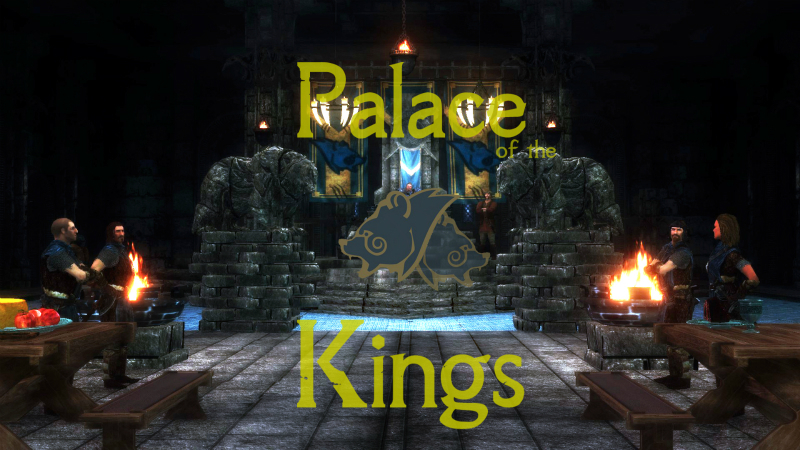 Fixed a typo "Palace of the Kings West WIng" > "Palace of the Kings West Wing"
Removed a flickering light around the fire in the Great Hall (where Balgruuf is sitting in his usual Throne). Slightly remodeled the armory area downstairs. Modified the Navmesh in a few areas in Riften Worldspace to resolve the missing inked triangles errors. (2) Removed the majority of records that were not necessary for the mod to work from the esp. There was no harm in leaving these records but it's always a good idea to keep the file pristine. (2)Updated all of the compatibility patches. Added a few missing script files that were necessary to let you obtain the key to the Auxiliary's Chamber in Castle Dour. (1) In Dragonsreach, the custom chandeliers were removed which may prevent CTD problems upon entering this interior cell from happening. (2) In Dragonsreach, an issue with a few of the walls not being aligned well together has been fixed. (3) In Mistveil Keep, the NPCs will no longer request player to leave after 9 p.m. This is what I consider as a vanilla bug, while being untouched by Unofficial Skyrim Patch or Immersive Citizens. Instead, now they will ask you to leave if you are hanging out inside Mistveil Keep Jarl's Chamber after 9 p.m. I believe this is how Bethesda had intended in the first place until they've mixed up the public area of Mistveil Keep with its Jarl's Chamber. (4) Ulfric Stormcloak can now be seen meditating in 2 locations early in mornings. My AI packages that allow him to do this were not functioning, but now it's fixed. (5) In Palace of the Kings, 2 SoldierIdleMarkers have been adjusted their height. (6) In Palace of the Kings, 2 Stormcloak soldiers were changed so they will inherit the face variants from generic Stormcloak soldiers. (7) In Castle Dour, the Navmesh is slightly modified for better NPC passing. 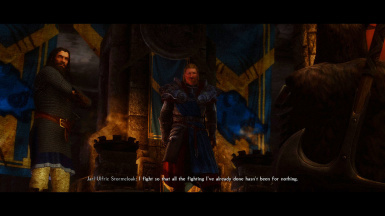 (8) The scene about Balgruuf performed by Ulfric and Galmar has been slightly re-modified so Galmar can position himself properly when the scene is initiated. (9) The Alias flags in Castle Dour conversation scenes performed by Rikke and Tullius were modified properly. 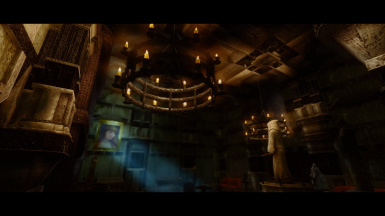 (10) A new interior cell called Castle Dour, Emissarium has been added and now can be accessed from Castle Dour. Although there is no t much in this room, it serves a major role in the upcoming Quest Add-On for Palaces & Castles Enhanced. (11) The rats in Palace of the Kings Underground were adjusted their health value. (12) A few typos in the interior cell's name, books, dialogue options, have been fixed. Every patch file has been given necessary update, so please make sure to install them and recreate your merged patch if you have it. The new compatibility patches for the following mods have been also added. (1) The compatibility patches for Unofficial Skyrim Special Edition Patch were renamed as following. I'm aware that the change in the name of these esp files may cause certain issues, but I felt it was mandatory. Sorry. (2) The USSEP patch now requires Palaces & Castles Enhanced main esp and fixes a few floating objects in Palace of the Kings. I forgot to include some of the necessary textures in the former version. Also, facegen files for 1 new NPC was missing. I have redone how Palaces & Castles Enhanced handles the change of outfit for the affected NPCs. The exiled Jarls and servants will have their items confiscated, while the new Jarls and sercants will get dressed more appropriately. This feature has been implemented since the first release, but it had some flaws. Now in this version the script has been re-written to work flawlessly. Added functionality to make it relatively safe to uninstall the mod in mid-paythrough. Check out my sticky post for details. Issue with Legatte Rikke wearing Captain Holza's outfit has been fixed. 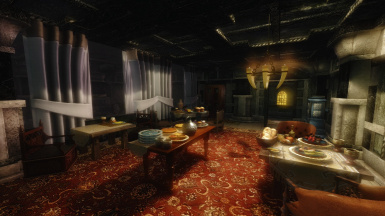 Navmesh in Blue Palace Parlour and Kitchen & laundry Quarters have been fixed. Now Odar will travel to the kitchen to do his job. Minor improvements in various interior cells. Fixed several object placement issues. Several of the new dialogue options have been tweaked their conditions. The AI used by the exiled NPCs in Blue Palace Old Dungeon (the former Imperial government NPCs) have been altered. The mini-quest in Palace of the Kings Cellar had a bug, that the guards will keep chase you even though you've gotten out of the cellar, as if you're still trespassing. Fixed the bug and added small improvements to the quest. The following patches have been updated. Getting this mod to work may not be easy. What I expect for its users is to read and acknowledge the most essential part of the description beforehand. This is a comprehensive mod that I have been working on for 2 years. So there's a lot I did here, and I want you to enjoy it at its very best. If you don't pay enough attention to what I write here, you'll probably have "ruined" experience, which is what neither of us want. 1. Load "Palaces Castles Enhanced.esp" at near the bottom of your load order if not the very bottom, and do not let LOOT or BOSS sort my plugin as these tools are known to place my plugin near the top of your load order, which is wrong. 2. New Game for the best, most likable experience. You can install it in ongoing game saves, but some objects will not be correctly placed if the mod is installed in mid-game which may cause some bad issues. This is due to the way Skyrim's game engine works, not a fault of the mod. 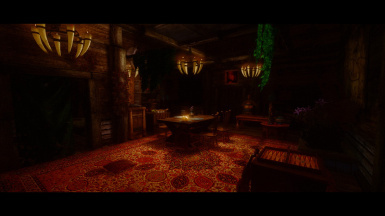 Remodeled interiors for 5 major palaces and castles in Skyrim, including Dragonsreach, Blue Palace, Castle Dour, Mistveil Keep, Understone Keep, and Palace of the Kings. 16 new interiors. The NPCs inside the castles and the palaces will have new behaviors and daily schedules according to he changed interior layouts and the addition of new living quarters. Dozens of new NPCs with clear purposes and daily schedules to add more livings and a realistic feeling to the palaces and the castles. Dynamic changes and additions related to the progress of the Civil War quest-line. An excitement of finding secrets and re-discovering the great history of the great palaces and castles of Skyrim. Several quest-based events that take place inside the palaces and the castles. Overall, many new surprising, exciting, beautiful additions as a proud result of of over 18~24 months of modding. Provides support for the users with several popular mods. Polished with several mod-development tools. Any unnecessary or dangerous records are carefully taken out to be a free-f bugs mod. You've ever been disappointed at how Blue Palace in Solitude was not like a grand "palace" that you imagined? Have you wondered why Palace of the Kings is so empty and has nothing to tell us about the age when Ysgramor himself lived in the same castle? Have you ever felt that the palaces and castles in Skyrim lack a bit sense of reality and overall unexciting and disappointing? Well then, this mod is for you! 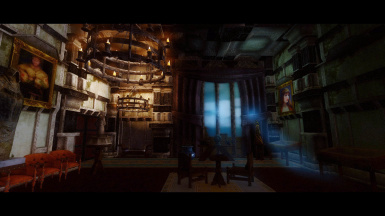 Palaces and Castles Enhanced aims to bring much more depths to the Jarl's residences in 5 major cities. All interiors in every palace/castle have been dynamically remodeled having sense of authenticity in mind. You will find new rooms such as comfortable-looking living quarters, armories, banquet halls, bath halls, secret vaults and much more. 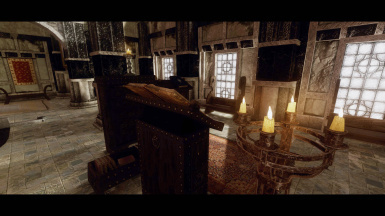 The Jarls and the servants will find more to do with their time, relaxing in the new rooms, keeping themselves clean in the bath halls, and so much more! 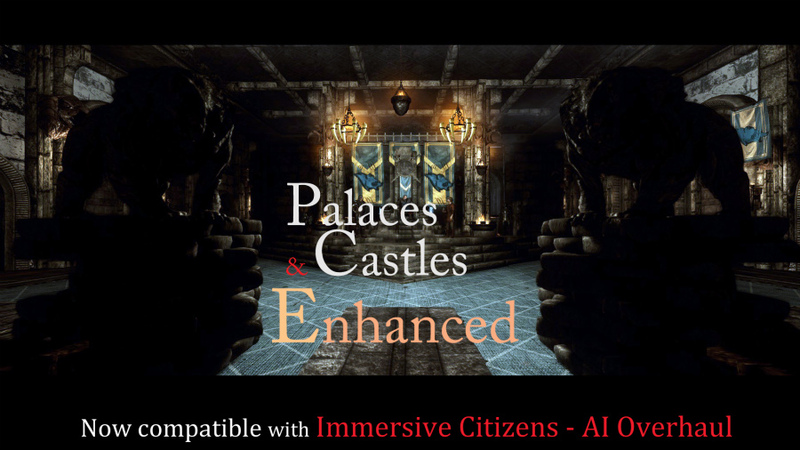 3 of my mods with the title "Palaces and Castles Enhanced" including Royal Blue Palace, Medieval Mistveil Keep, and Palace of the Kings' Fury have been combined together as a single .esp file and tons of new features and further improvements are added. Yes, this is a complete overhaul of 5 palaces and keeps of Skyrim with the size of 4 mods. This is the project which I, as a modder, will proudly present to all Skyrim lovers as my compilation. 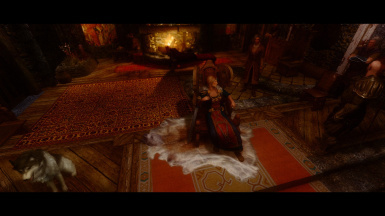 From now on, you don't need any other mods to enhance the royal livings in Skyrim! Blue Palace was redesigned to look like a grand establishment suited for the High Kings and Queens. palace was not given enough space to be built as a grand-looking architecture from a start. 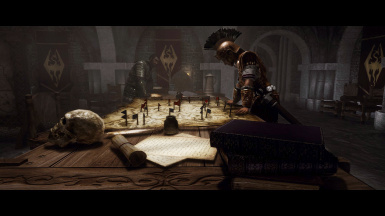 I believe they had little interest in making interiors that actually match how the buildings look from the outside in general, but Blue Palace had to be an underwhelming residence with just a few of humble living quarters and the smallest throne room in Skyrim because of the limitations that the city's level design created. So I remodeled this palace not in a way that matches the poorly-designed exterior but so that it would consist of maximum nobility fit for the capital. All private rooms added by the mod are off-limits until you kill the necromancers in the Wolfskull Cave and win the members of the Court's trust, which then you will be freely welcomed in these private rooms. 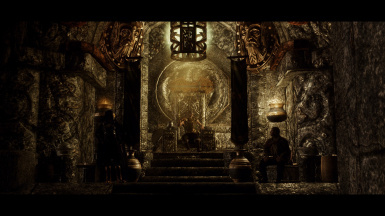 The Jarl of Solitude, Elisif will choose her private chamber to discuss with the Dragonborn about placing Torygg's war horn at the shrine of Talos. Every member of the Court except Sybille Stentor will travel to the banquet hall named "parlor" at 3p.m. to take a royal meal. In addition, everyone except Thanes and lower servants will use the bath rooms to keep themselves clean. An amazing mod artist Lind has kindly shared the beautiful textures for Sybille Stentor's blue wizard robe. This robe cannot be obtained as it is marked as unplayable. So if you want this beautiful robe for your own character, please go to Lind001's mod page where you can download it! 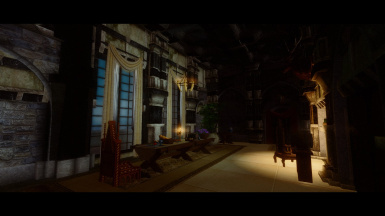 New interiors: Stewards Living Quarters (Private), Jarl's Living Quarters (Private), The Parlour (Private), The Kitchen and Laundry Room (Private), Old Dungeon. You can obtain the Jagged Crown after delivering it to General Tullius. 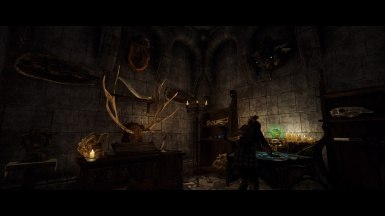 You can freely visit the new interiors without trespassing after completing the quest "The Man Who Cried the Wolf"
Elisif, Falk Firebeard, Bolgeir Bearclaw, Sybille Stentor, Thane Bryling, Thane Erikur, Irnskr Ironhand, Melaran, and Palace Guards are given a completely new set of daily routines. The members of the court will now travel to new locations to eat, study, bathe, and so on. New music scores along with "Imperial Thrones" will play inside Blue Palace and its related areas. New outfit for Sybille Stentor. Improved conversation scenes at the court. The delivery quest "Elisif's Tribute" is modified so that you will meet Elisif in her private chamber at night time, rather than discussing Talos worship in public. Mistveil Keep in Riften is quite different from Blue Palace in terms of being a fortress built stability in mind. I tried to make it look as true to the original level design of the keep as possible while making some both necessary and pleasing changes here and there. The dining table placed in the great banquet hall is only used 3 times a day by the royal family and their servants in their breakfast, lunch, and dinner time. 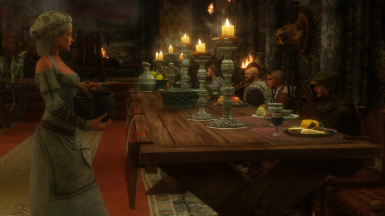 Saerlund, a disputed son of Laila, cannot join the rest of his family for their meal and instead he has to eat in a small table placed near the fire and spends the rest of his day sitting on a bench, being allowed nothing else to do. Laila owns a husky she bought from the Fort Dawnguard located just west of Riften and a mysterious new cook named Padma finally shows up with an important duty to sate the appetite of the royal family. 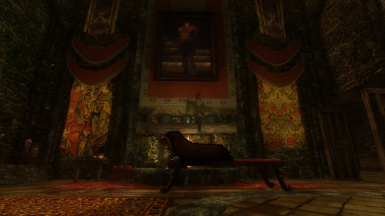 A big painting of the Jarl is proudly hanging on the wall behind the Throne, which will be replaced with the painting of the new Jarl according to the result of the Civil War. 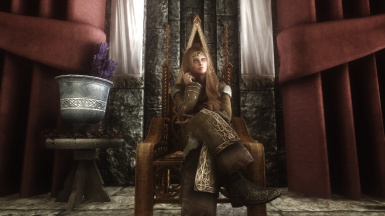 The Jarl will be more busy and no longer sit on her Throne all day long. But she will remain inside the Keep, for there is the safest place for Laila in Riften especially when the war is going on. Instead of going out, she will attend to a daily council to discuss with the commander soldier about the situations of the war as well as writing missives to deliver words to the people of importance in and out of the Rift. 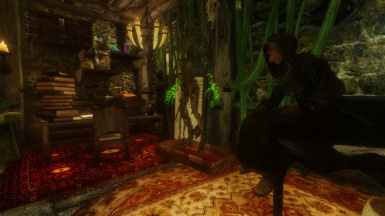 Much like any court wizards in every hold in Skyrim, Wylandriah is usually left alone and given freedom to work on some odd experiments and study, as well as to go to the alchemy shop down in the lower walkway by the canal. 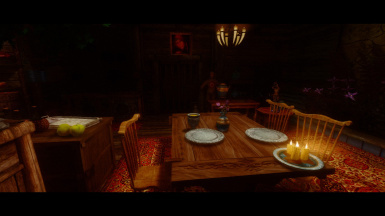 The private room for the Jarl and her sons are also dynamically remodeled to look cozy and comfortable. From there you can access to the terrace, where you'll find a bath where they will come to bathe in night time. 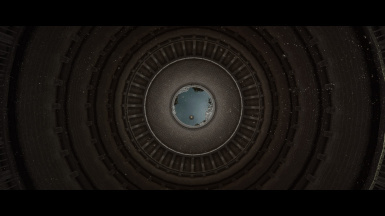 And finally Mistveil Keep has a secret tunnel which is designed to lead them to outside the city in the event of a siege, for such is how any military fortresses are supposed to be designed. Redesigned quarters and hallways: Mistveil Keep, and Mistveil Keep Jar's Living Chamber. New interior: Mistveil Keep Tunnel. A cook named Padma and Laila's personal guard husky. Vastly revised daily routines for the Jarl of Riften, the Steward, the Housecarl, Wylandriah, Harrald, and Saerlund. All of them will bathe once a day. A painting of the Jarl, which changes according to the result of Civil War. New music scores will play along with "Dragonsreach" inside Mistveil Keep and its related areas. All of the conversation scenes between NPCs at Mistveil Keep were revised so that they are more smooth, realistic, and dramatic. One thing you will notice once you entered the Palace of the Kings is that it's "bigger". Every piece of architecture is overall bigger and creates massive and dynamic atmosphere which I wanted for this old castle with great history. Ulfrc has his own army of housecarls just as how actual Nordic kings had their own army of húskarls. There are 2 sellswords to guard the war room and a new servant who is a son of Sifnar Ironkettle, also a servant, and a master huntsman named Hasbir who goes out to hunt animals in the wild and brings the carcasses back to the castle. Also, there are several Stormcloak Recruits who were granted the honor of guarding the palace. 2 of the living quarters are renamed to show their distinctive purposes and are remodeled as well. 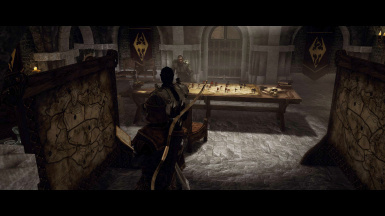 WIndhelm Barracks, also known as Windhelm Bloodworks, is also remodeled to have more beds for every guard to sleep in and to actually look like one of the headquarters of the Stormcloak army. There are several new interiors including Bath Hall, Old Library, Old Prison, Abandoned Living Quarters, Palace of the Kings Cellar, Palace of the Kings Underground, and the new alchemy shop called "Freyja's Potions". It's an old castle, so there are now many parts of the palace abandoned for ages and some of them are said to be "haunted". The rumors with Palace of the Kings Underground holds that there are still the spirits of Ancient Snow Elves left for dead in its prison cells. The Cellar is strictly off-limits to anyone excepts for the Jarl and his steward and few of his servants only. If you go down there, expect some kind of trouble. With the rumors of him being in deep with the arts of necromancy, Wuunferth the Unliving, the mysterious Court Wizard, is not the most popular man among the inhabitants of the Eastmarch. That's where Freyja, the alchemist, comes in. She is a nord woman who has a shop in the palace and aids sick citizens, injured soldiers, weary travelers, young couples with issues, all alike. Like many alchemist in the world she too is a "unique" character, but if you're looking for some alchemy ingredients, potions, or even deadly poisons, maybe you should visit her shop. If you sided with the Imperials in the Civil War quest line and challenge Ulfric a final battle in Windhelm, you must get past all of the Stormcloak Recruits (~Lv.3) out in the city and all of his housecarls (~Lv.15) and 2 sellswords (~Lv.40) in the palace. The sellswords are especially deadly but while Ulfric's housecarls and recruits try to fight you till death, the sellswords will try to flee once you defeated Ulfric and Galmar and their payments become unsecured. You can kill them, of course, but if you decided to spare them, you will find them in Riften, the city of thugs, where you will be able to hire them as your own mercenaries. Redesigned quarters and hallways: Palace of the Kings, Palace of the Kings Upstairs (the one where Wuunferth's room is in. 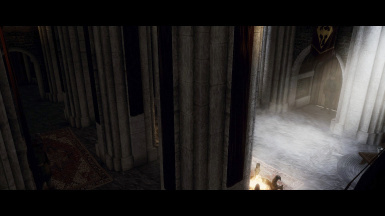 Now renamed as "Palace of the Kings West Wing"), Palace of the Kings Upstairs (the one where Ulfric sleeps in. 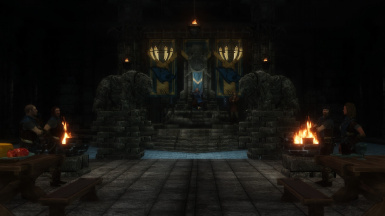 Now renamed as "Palace of the Kings Upper Rooms"), Windhelm Barracks. New Interiors: Palace of the Kings Cellar, Freyja's Potions, Abandoned Living Quarters, Palace of the Kings Underground, Bath Hall, Old Library. Heavily revised daily routines for the Jarl, Galmer Stone-Fist, Steward, Wuunferth the Unliving, Sifnar Ironkettle. All of them will bathe everyday. Adds a few new daily routines for Captain Lonely-Gale and Torsten Cruel-Sea, who were supposed to have a conversation scene with Ulfric but never actually visited Palace of the Kings. 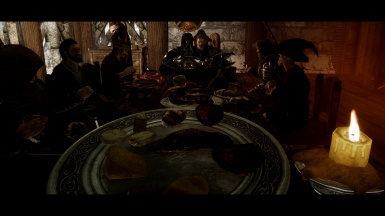 New workers at Palace of the Kings, such as a huntsman named Hasbir who sells you some meat, a couple of new servants, 3 new Housecarls for Ulfric, 2 new mercenaries for Ulfric who can be hired as your own after Ulfric is defeated. Some of them are your enemies in Battle for Windhelm. New music scores will play along with "Dragonsreach" inside Palace of the Kings and its related areas. Dynamically gets remodeled after Imperial's victory in Windhelm. The conversation scene between Galmer and Ulfric, in which Galmer asks Ulfric if they can turn a dragon into an ally to Stormcloak, have been changed its triggering condition so that it, hopefully, can be seen more frequently. Deagonsreach has been a great establishment with an exquisite noble Nordic design. 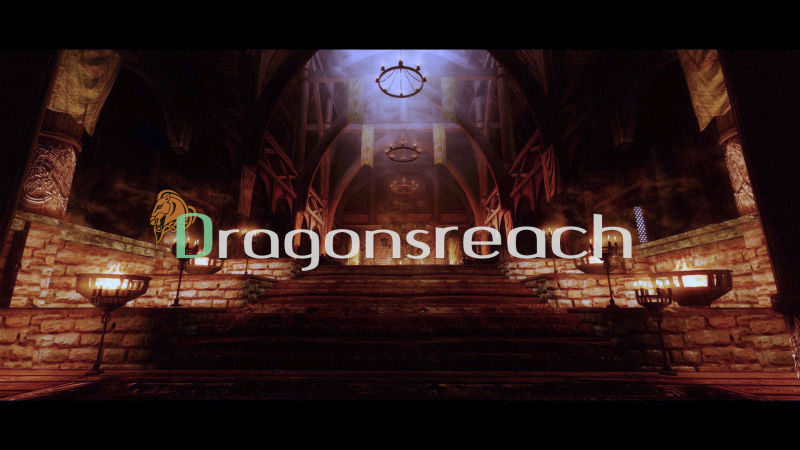 I believe other palaces in Skyrim could use the same love as Dragonsreach recieved. It is undoubtedly one of the most frequently-visited locations in game and for there are many mods depending on the original design done by Bethesda, I did not overly change the layout of this palace. Instead I added some "details" that could have been there if the palace could be more realistic. Like many interiors I have worked on for this mod, much of the inspiration for the kitchen and Farenger's room comes from the actual medieval castles and manors' interior design. There is a new room which you can access from the Jarl's Quarters. In there you'll find the Housecarl's private room which has been oddly missing in Vanilla Dragonsreach as well as an armory hall and a bath hall. In addition to the Jarl of Whiterun and his housecarl and steward, Hrongar and Farenger will also come here to bathe. This new room is named "Armory & Bath Hall" and was actually designed to be what could have been there in vanilla from the look of the keep. 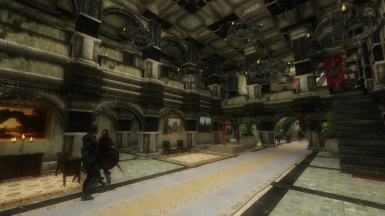 Redesigned quarters and hallways: Dragonreach, Dragonsreach Jarl's Private Quarters. Adds a few new daily routines for the Jarl, Steward, Housecarl, Hrongar, and Farenger Secret-Fire. All of them will bathe everyday. All conversation scenes between the Jarl, Housecarl, Steward, and Hrongar that take place inside Dragonsreach have been revised. Provides Irileth a proper place to sleep. New music scores will play along with "Dragonsreach" will play inside Dragonsreach and its related areas. 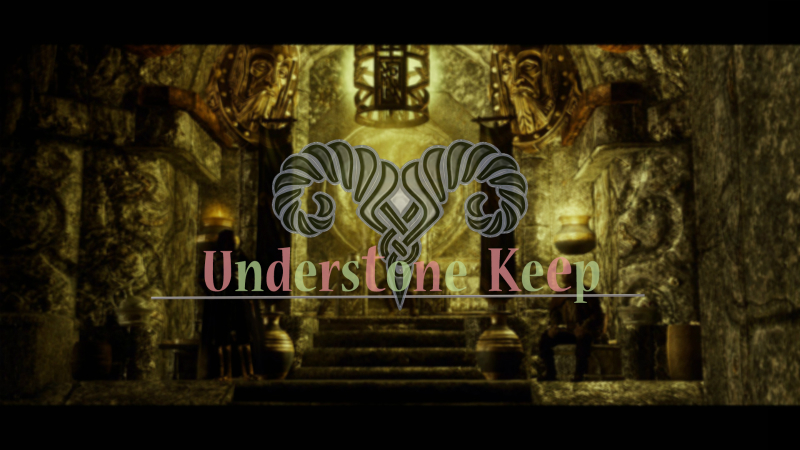 Understone Keep has a distinct characteristic in its Dwarven origin. Not just with its architectural design but in a way many objects and items are placed, it seems to me that it was designed just like other Dwarven ruins in Skyrim. I have corrected some visual errors that this keep had originally and made some small improvements here and there. Many rabbles are cleared in some areas. Calcelmo's lab looks more functional and is now his proper study. 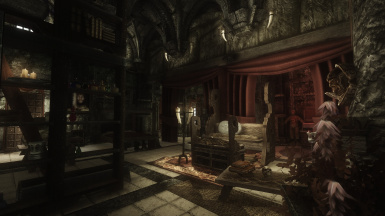 There is a new interior cell named Understone Keep Private Quarters, with the bedrooms used by the Thalmor soldiers and their commander, Ondolemar. 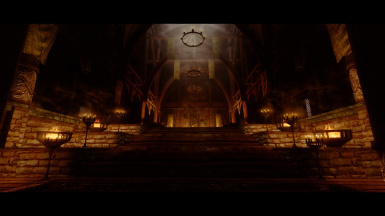 It also has a cozy bath hall which the Jarl, the Housecarl, the Steward, and Ondolemar will come to bathe. 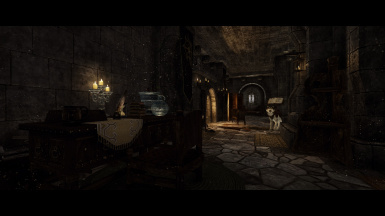 The bedrooms in the Private Quarters will also be used by Igmund, Faleen, and Raerek, when the city was taken over by the Stormcloak army as a result of the Civil War. In vanilla, these 3 people had to move to Blue Palace in Solitude, which causes Calcelmo to literally run to his lover in the capital during the Mara quest. Adds a few new daily routines for the Jarl, Steward, Housecarl, Aicantar, Calcelmo, and Ondolemar. Everyone except 2 mages will bathe everyday. 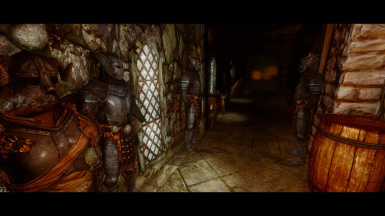 Faleen will no longer imprisoned in Blue Palace after the defeat of Imperials in Markarth, but instead transported to Understone Keep Private Quarters, to prevent Calcelmo from running & swimming all the way from Markarth to Solitude during the Mara quest. All conversation scenes between the Jarl, Housecarl, Steward, Calcelmo, and Aicantar that take place inside Understone Keep have been revised. New music score along with the vanilla music will play inside Understone Keep. Castle Dour has been revamped in V1.6 of Palaces and Castles Enhanced. I have not spent great amount of time rebuilding this castle. It doesn't have a bath hall or modify the schedules of any NPC. But you might enjoy some of the features if you're a loyal Imperial Legionnaire! Once you've delivered Jagged Crown to General Tullius, ask him if there's any bed for you to use in Castle Dour. He will give you the key to your own, comfortable if a little small bedroom suited for a Legionnaire. Further more, once you've been raised as a Tribune, you will be able to get a key to Castle Dour Tower which you can use as your own. Castle Dour Tower is one of the unused interior cells in Skyrim which would have been located just above General Tullius' bedroom. To obtain the key, just ask General Tullius "Is there anything else?" 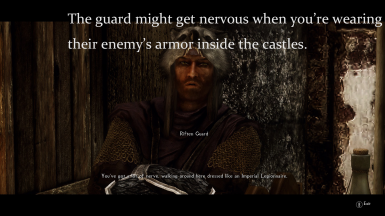 after you've became Tribune, or speak with Ulfric Stormcloak after you've conquered Solitude as a Stormcloak soldier and ask him for the key to the tower. Several new soldiers with different ranks with their own daily routines. A new cook will sell you food once completing your first mission as Imperial soldier after taking the oath. You can now obtain a key to your own private chamber in Castle Dour after completing your first assignment for the Legion. You can also obtain a key to Castle Dour Tower after completing all of your missions for the Legion. Speak with General Tullius and he will grant you these keys when you ask him. All conversation scenes in Castle Dour were revised. You see, I've always wondered how such an excellent, well-preserved fortress as Fort Dawnguard was just…there, like it came out of nowhere. Was it just lying around for Isran's taking? I mean, wouldn’t the Jarl of the Rift have issues with Isran and his group inhabiting there, naming themselves “Dawnguard” from old stories? With addition of a few “lore” books, intended to add more detailed back stories to Fort Dawnguard and a few members of Dawnguard including Isran and Celann, now we can (hopefully) feel more attached to these vampire hunters. Of course, none of the lore mentioned in these books should be considered as part of Bethesda’s Skyrim lore, just a fan creation straight out from my daydreams. The interior of Fort Dawnguard has subtle yet highly noticeable changes. Overall the fortress now looks a little more organized but the warrior’s guild-like atmosphere is still there, with generic items lying around on the floor and so on. As soon as the Fort’s renovation starts after recruiting Sorine Jurad and Gunmer, cobwebs and a few other junk items in some areas will be taken away and new furnishings will be available. Your own private quarter is also redesigned and has a little more pleasant, farmhouse-esque feeling. Redesigned quarters and hallways: The entry Hall, main guild hall, crafting area, cave areas, upstairs bedchambers, and Player’s private chamber. Newly-added quarters: Cozy bed chambers dedicated for a few Dawnguard members, and Fort Dawnguard Vault (New interior cell). 3 new books, found in Fort Dawnguard. A few more trolls and huskies to better populate the cave areas. Slight improvements for Dawnguard members' daily routines; slight changes are made in their work & sleep locations, etc. Does not add any new behaviors like bathing, etc. The conversation between Sorine and Gunmer about Florentius will not be triggered until Florentius is rescued from Ruunvald. 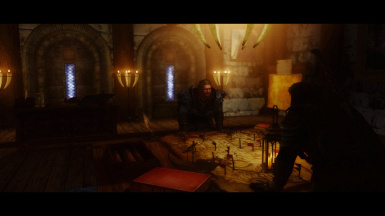 The conversation scenes between Gunmer and Isran, one in which Isran asks Gunmer about his plan involving the use of Armored Trolls and another in which Isran and Gunmer discusse about forging Dawnguard armor and weapons, will not be triggered after the main quest of Dawnguard is completed. Actors now properly face each other, make proper facial expressions when appropriate, do not pose awkwardly between sentences in all of the Dawnguard conversation scenes. Several new workers who attend to their work in and out of Fort Dawnguard. 2 of them will remain after the renovation is completed. 1 new cook, an Argonian named Salty-Fingers, whom you can purchase food from after completing the first Dawnguard quest “Prophet”. 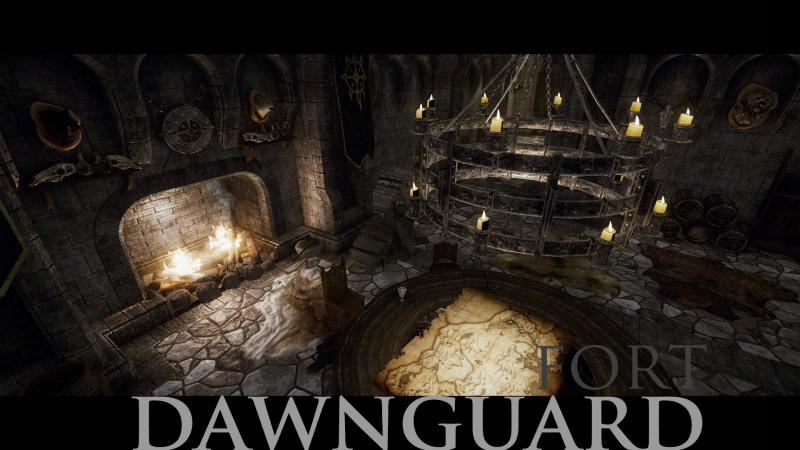 Please note that any mods that make changes to Fort Dawnguard interior is incompatible with Palaces & Castles Enhanced, but compatibility patches with 3 major lighting overhaul mods and Horse on Patrol - Dawnguard are available. Palaces & Castles Enhanced does not edit the World Space “Dayspring Canyon”, being consistent to my focus on interiors. There will be NO compatibility patches or whatever means of support for any ther Fort Dawnguard-related mods, so if you wish to use one of those mods in combination with Palaces & Castles Enhanced, it is advised that you put Palaces & Castles Enhanced after that mod as well as making edits to it by using TES5Edit if necessary in order to avoid conflicts. For more detailed information on compatibility, please take a look at the Article section where all of the compatible & incompatible mods are listed. New "Immersive" Music Plays in 5 Palaces! New music scores for 5 palaces and castles in Skyrim. Now that we have more variations of songs that play inside the palaces and castles, the vanilla music score "Imperial Throne" will no longer play in Palace of the Kings, Mistveil Keep, or Dragonsreach. All music tracks used in this mod are also used in Hothtrooper44's Immersive Music mod, so if you've played Immersive Music you know what kind of music you'd expect to be played. They're fantastic and very historical music scores performed by Adrian von Zielger that add the sense of spectacle to the Jarl's residences. If you wouldn't like these new music scores to play, you have the option file "No Custom Music Patch" to revert the music settings to vanilla which you can install along with the main plugin. All NPCs in the palaces and castles are now seen doing new things in the new areas and overall much more lively and active. The Jarl will no longer just sit on their Throne all day long so Ulfric's statement of being a busy man is no longer a false statement. The noble people of Skyrim finally bathes now that they have bath halls in their palaces. 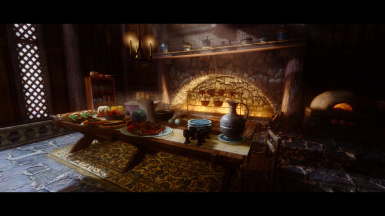 Every Jarl, Housecarl, Court Wizard, and Steward will use their bath halls every day as well as a few others who live with them, such as lower servants and family members of the Jarls. When they enter their bath halls they will undress before dumping themselves into a hot water. Inside the baskets in the bath halls you'll find their equipped armors and clothing. If you're playing as a thief and looking to steal from them, their bath time is a great chance for it! Other than bathing, many of the people in 5 palaces have been given special activities to attend to. Ulfric can be found in Temple of Talos in early morning, Laila holds a war council, and much more! Many changes will be brought to the castles and palaces as you progress the Civil War quest line. If you sided with the Imperials and gave the Jagged Crown to Tullius, you will be able to find it later somewhere in the Blue Palace. If you gave the Crown to Ulfric, then the Crown will be there for your taking in the Palace of the Kings. Some dramatic changes will be brought to the palaces and castles in Skyrim when the parent city is taken over by the opponent faction of the Civil War. 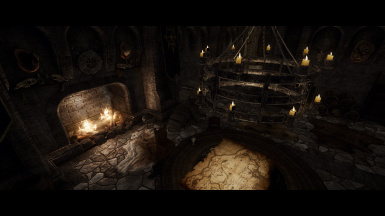 The painting of Jarl Laila in Mistveil Keep will be removed and the painting of the new Jarl will take its place. A new dummer servant will be welcomed into the Palace of the Kings after the Imprials take over Windhelm. A new Jarl will be wearing the attire fit for the Jarl. This is the similar feature introduced in Appropriately Attired Jarls mod. However the outfits the new Jarl will be wearing are not identical to that of the old Jarl in my mod, unlike Appropriately Attired Jarls. When the Jarls, Stewards, Housecarls, and their family members at the palaces & castles get exiled from their cities due to their defeat in Civil War, they will now get much harsher punishment. 1. Their belongings, including their armor, noble clothes, circlets, rings, will be confiscated by their enemy. They're quite literary stripped off their titles and all the wealth that went with them. Their confiscated belongings will not just disappear, but be stored inside the chests found in some of the palaces and castles. 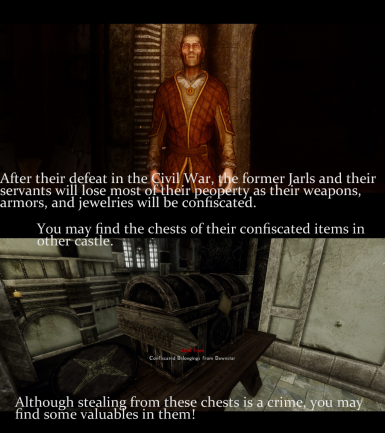 Stealing from these chests is a crime, but you may find some valuables in them! 2. Because of this, they will no longer dress like they used to. They're much like commoner now, and under the grace of their allied Jarl, they are only allowed in some specific areas in the palaces and castles. If the Jarl is sided with Stormcloak, they will be transported to Old Dungeon in Blue Palace. If the Jarl is an Imperial loyalist, then they will be sent to Old Soldiers' Quarters in Palace of the Kings. They will no longer attend to their endless drinking party at the castle and you won't see them unless you visit those locations. There are some, however, who don't get their punishment in this way. 1.) Korir, the Jarl of WInterhold who supports Stormcloaks, and his family members will be moved to Brunwulf's house in WIndhelm just like vanilla Skyrim. Their belongings will not be confiscated as they don't own much from a start. 2.) Jarl Igmund of Markath who supports the Empire along with his housecarl Faleen and steward Raerek are also exceptions.Their belongings will be confiscated just like the others and their outfits will be changed. 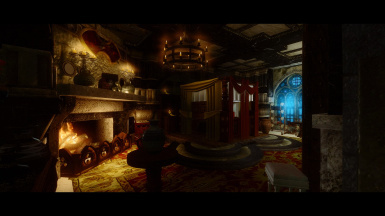 However their place after the exile is not Blue Palace anymore, but the new private quarters in Understone Keep. In Vanilla Skyrim, due to the fact that Faleen is transported to Blue Palace after being exiled, Calcelmo literally marathons all over Skyrim to find his lover in the capital during the Mara quest. 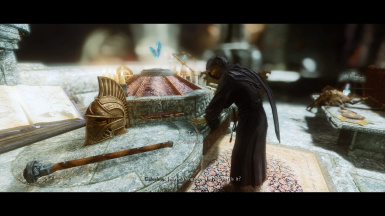 I always found the whole scene hard to watch how he has to exhaust his old age like that, so Faleen along with her Jarl and also the steward won't leave Markarth anymore. But they are not allowed to leave the dark private quarters nor they can access to their confiscated items which you can find in the Jarl's living quarters in Understone Keep. The private quarters will be heavily guarded so essentially it's their prison. I'm confident to say that I did the best I could do to make this mod compatible with many other mods, for 4 reasons. 1. It doesn't change the exterior. Palaces and castles Enhanced is only about interiors. 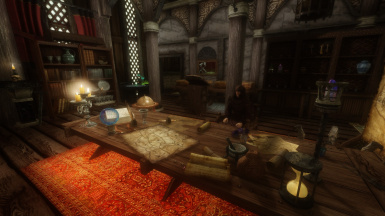 Although it has worldspace records inside the plugin, it is perfectly safe to use along with other city overhaul mods such as JK's Skyrim, Dawn of Skyrim, Expanded Towns and Cities and so on, as long as they don't change the interior design of the keeps. 2. No vanilla unique NPCs are edited. Yes, it adds new behaviors for npcs, but their new behaviors are given to them through quest aliases. This mean you can use any mods that affect the vanilla NPCs such as fantastic Bijin mods by rxkx, Ordinary Women, my another humble work called The Men of Winter, and so on. 3. No dirty records! By the dirty records I mean any unnecessary edits that are created in the process of mod-making and some dangerous edits to mark vanilla objects as "deleted". This mod is cleaned by TES5Edit by using both automatic procedure and polishing method by hand. 4. We have a plenty of Compatibility Patches. I have a humble suggestion for anyone who're interested in using this mod, to install the following visual enhancements mods as well. Most of the mods bellow are very popular and perhaps you have had them already installed. Although they're not required at all, I highly recommend to use them to make your palaces look more superb. : PCE adds 2 horses in the Mistveil Keep courtyard and they'll be wearing the purple horse cloaks if you have Horse Cloaks by Hypno installed. All you need is its meshes and textures so you don't necessarily have to activate its esp file. The horses will be "naked" if you don't have these files, but that wouldn't cause any serious problem. : His Bijin mods are the reason why I'm modding. : A very neat collection, has the best Sweetroll retexture too! :The Touch of White from HXP's mod is also good. : For Windhelm architectures. I simply let Noble Skyrim overwrite Authentic Windhelm for perfection. I think Noble Skyrim's textures for Palace of the Kings interior parts are exceptionally superb. Also I really like textures for the noble furniture in Noble Skyrim and I recommend to use this one or Langley's mod for them. : For rugs, display cases, and noble furniture textures. Although I personally prefer Noble Skyrim for the noble furniture textures, Langley's textures are also amazing. : Surely a must have for everyone. : For Mistveil Keep and the Riften tunnel interior/exterior. If you'd like to have a bit more fanciness in Riften architecture, how about CoP - Riften by Foggypath? : For Solitude architectures. Pfuscher's Paralax Solitude mod is also great! : For Dwarven clutters in Understone Keep. Use one of the mod manager tool to install. Use NMM or MO, you choose. Now you have 2 main files to download. One is the BSA archive which contains all new creative assets. Another is the esp file, which is going to be updated more frequently than the BSA archive. I know the size of the BSA weighs a ton, sorry! Now don't forget to activate Palaces Castles Enhanced.bsa before you play. Otherwise you don't get any new assets visible in-game. You have to place Palaces Castles Enhanced.esp near the very bottom of your load order. LOOT likes putting my plugin near the top of your load order, which is really wrong. If you use LOOT, don't forget to lower the load order of Palaces Castles Enhanced.esp later. If you have knowledge of using TES5Edit I advice you to look through your entire load order with TES5Edit and see if there's any conflicts with Palaces Castles Enhanced.esp, and make your own patch if you noticed a sign of conflicts. Start the New Game if you can. The new game always works much, much better. Some of the persistent objects such as Thrones maybe missing if you try to install it onto the ongoing save data. If you install this mod in mid-game and encounter any "weird" issue with it, it's most likely due to your installation. 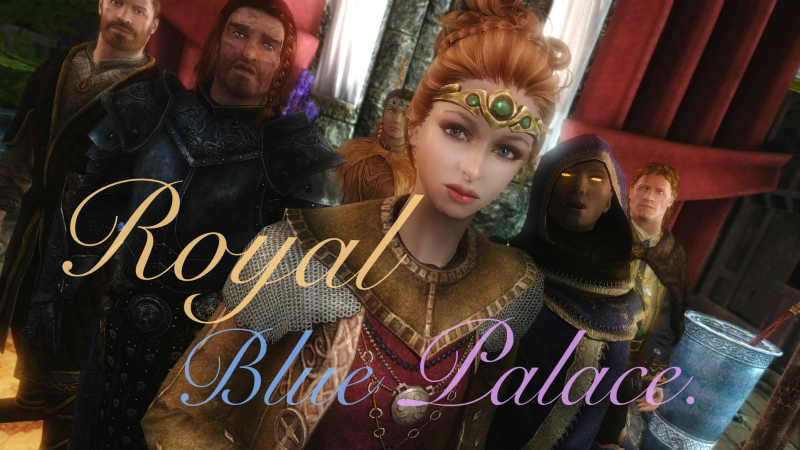 If you used any of my past Palace works including Royal Blue Palace, Palace of the Kings' Fury, and Medieval Mistveil Keep, and are interested in trying out the new Palaces and Castles Enhanced (YOU have my dearest thanks by the way!! ), you can think of it as the updated version of these mods. However there could be some issues with the object placement if this mod is installed in other ways than starting a new game. I will make a new article in the near future about how to deal with some bad issues which every mid-game installer may encounter. [url=https://www.youtube.com/user/AdrianvonZiegler]Adrian von Ziegler - All new music scores used in this mod are performed, recorded, shared, and owned by Adrian von Ziegler. Many, many people's creative assets are used in this mod. There even were many people who generously shared their amazing creations with me when I asked them, and supported me with their kind words. Without them my mod could never be made. I'd like to thank everyone who supported me in the process of making this mod. Thank you DDVIL, for allowing me to use your amazing ring textures in Rings fit for a King-Queen. 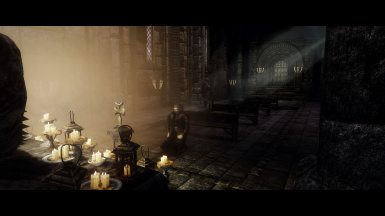 Thank you, Daemonjax, for your Just In Time Lighting Dynamic Scripts and Tutorial (https://www.nexusmods.com/skyrim/mods/10361/). 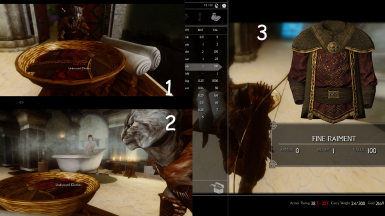 Thank you sirwho, for allowing me to use your Wizard Hats(http://www.nexusmods.com/skyrim/mods/75318).